Jesse J. Holland - Black Panther: Who Is The Black Panther? 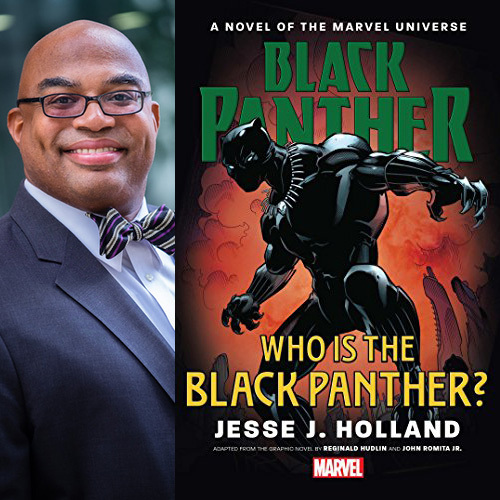 Just days after the release of the highly-anticipated “Black Panther” film, Award-winning journalist and author Jesse J. Holland will share his celebrated novel featuring the superhero, Black Panther: Who Is The Black Panther? at a National Press Club Headliners Book Event on Tuesday, February 27 at 6:30pm. In Black Panther Holland retells the classic origin of T’Challa, the original Black Panther who first appeared in American comic books published by Marvel Comics back in 1966, and updates it for the new century. Holland was also commissioned by Disney Lucasfilm Press to chronicle the history of the Star Wars franchise’s newest black hero, “Finn,” in the young adult novel Star Wars: The Force Awakens - Finn's Story. In addition to fiction, Holland is also an award-winning nonfiction author - his book The Invisibles: The Untold Story of African American Slavery In The White House, was awarded the 2017 silver medal in U.S. History in the Independent Publisher Book Awards and was featured as one of the top history books of 2016 by Smithsonian.com. Holland is a Race & Ethnicity writer for The Associated Press and teaches creative nonfiction in the Masters of Fine Art in Creative Nonfiction program at Goucher College in Towson, Maryland. Copies of the book can be purchased at the event. No outside books or memorabilia are permitted.